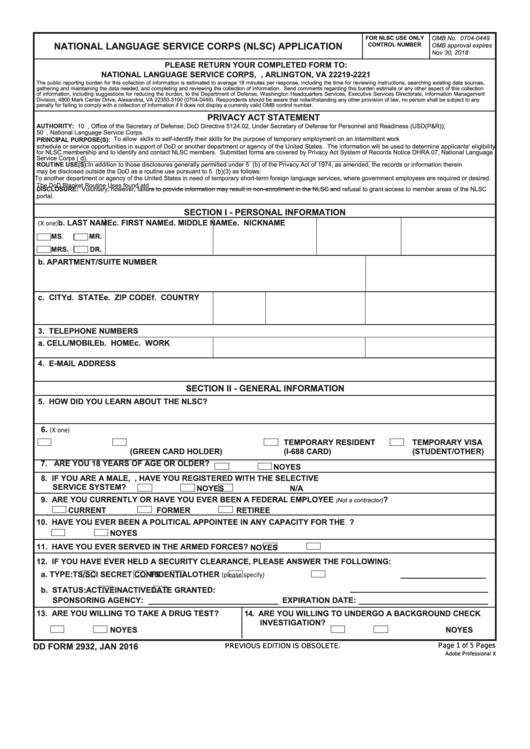 Download a blank fillable Dd Form 2932 - National Language Service Corps (Nlsc) Application in PDF format just by clicking the "DOWNLOAD PDF" button. Complete Dd Form 2932 - National Language Service Corps (Nlsc) Application with your personal data - all interactive fields are highlighted in places where you should type, access drop-down lists or select multiple-choice options. penalty for failing to comply with a collection of information if it does not display a currently valid OMB control number. 50 U.S.C. 1913, National Language Service Corps. To another department or agency of the United States in need of temporary short-term foreign language services, where government employees are required or desired. The DoD Blanket Routine Uses found at may apply to this collection. 5. HOW DID YOU LEARN ABOUT THE NLSC? 7. ARE YOU 18 YEARS OF AGE OR OLDER? 10. HAVE YOU EVER BEEN A POLITICAL APPOINTEE IN ANY CAPACITY FOR THE U.S. GOVERNMENT? 11. HAVE YOU EVER SERVED IN THE ARMED FORCES? 13. ARE YOU WILLING TO TAKE A DRUG TEST?